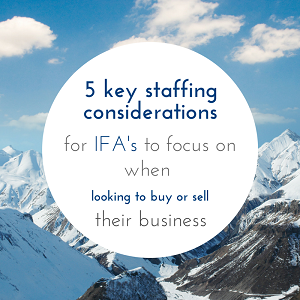 I interviewed Dawn Pearce-Herzberg on the 5 key considerations IFA’s looking to buy or sell their business should be focused on when it comes to their staff. Since RDR came into force, in December 2012, there has been a lot of changes within the financial planning sector. Dawn has seen many of these changes first-hand, having played a pivotal role in the setting up of the national financial planning company, Bellpenny, and more recently starting her own company, Vines Row; an IFA ‘match-maker’. Once an IFA business has made the decision to sell, what should they consider when it comes to communicating this to their existing staff. What can the advisers selling their firm do to limit the rumour mill as much as possible. What do you do with long standing members of staff that the firm want to take to the business that's buying them, although people aren't as qualified as the buying business would like them to be. If someone's buying a business and unfortunately redundancies do have to be made, how should companies handle that process? The biggest mistakes that can be made, what were the consequences of that in terms of how the staff and team felt and how they impacted the entire deal. How to spot a good firm to work with to help you through the buying/selling process and how to spot a bad one?